Super fresh bottle. White head with lace. Golden orange color. This is definitely a different beer than sue or ddh citra sue. Not as good as citra sue, but a nice beer none the less. Earthy and floral with a nice amount of orange and tropical fruits. Some pineapple. I like this, but not as much as citra sue. Solid brew that is easy to drink. Appearance: Pours a hazy golden orange with a moderate amount of bubbles. About a finger of white head that settles into a thin patchy layer. Smell: A very ripe and fruity hop driven aroma with a scent of citrus fruit and pine. Citrus hop scent of orange peel, grapefruit, mango, tangerine, apricot, and lemon. Earthy hop scent of pine resin and grass. Subtle malt hints of grains and caramel with yeast. A pretty nice juicy aroma. Taste: Like it smells, a ripe and juicy hop dominated taste with notes of citrus fruit and pine. Upfront citrus hop notes of grapefruit, orange peel, mango, apricot, tangerine, and lemon. Earthy hop notes of pine resin along with grass. Light background malt notes of grains, cracker, and caramel along with some yeast. A very good taste. Mouthfeel: Medium bodied with a moderate amount of carbonation. Very juicy and oily with a drying finish. Overall: A very good variant on Sue. Great juicy and earthy hop flavor. I absolutely love this beer. To me it's even better than the double dry hopped citra. Somehow they get the galaxy to work super well with the regular citra and it's just... tasty. Upon the acclaim of their PseudoSue, the brewers at Toppling Goliath give the popular pale ale a makeover with the exclusive dry hopping of Galaxy hops for a promise of citrus, tropical and botanical qualities, particularly in aroma. Galaxy Sue pours with the same golden haze at the original, unfiltered and topped with a foamy white cap. Bold citrus aromas of blood orange and pink grapefruit captivate the nose while tropical scents seem tangy, succulent and nearly tart with passionfruit. With a candied malt backdrop, seemingly of fructose and honeysuckle, the taste casts a light granola taste on the front of the tongue. The middle palate blooms with the brightness grapefruit with a juicy, grassy, berry and orange flavor. Once the malt sweetness subsides and the hops tilt toward the tangy, the tropical hop flavors evoke memories of Hawaiian Punch and orange sherbet. Smoothly bitter in finish, the ale retains just enough malt sweetness to offer slim balance to the hops. Smooth, creamy and masterfully balanced, the beer trends much more hoppy than malty, perhaps crossing the threshold into IPA territory, but its arid creaminess laced with soft pine resins and herbal hemp brightness allows the ale to charm the palate regardless of its intended style. A late palate of peppery bitterness, grassiness and chive shed light once more on those finishing Galaxy hops. Not your father’s Pale Ale. Definitely new school. Similar to NEIPAs ... sweet, but refreshingly citrusy. Crisp enough mouthfeel and finish to still be an American Pale Ale. Winner. Completely opaque, glowing yellowish-orange appearance. Much cloudier than the original PseudoSue I recently drank from a can. The turbid body was topped by a frothy, half-inch tall, bright white crown that fell to a thick, lasting collar. Odd shaped splotches of lacing stuck along the glass. The aroma was uber hoppy and fruity. Loads of citrus. Big freshly squeezed orange juice presence. Mango was also quite noticeable. Touch of honeydew melon. Bit of dank cannabis too. As the beer warmed, the cannabis notes really intensified. Skunky weed came to mind. Overall, really punchy and super smooth. The flavor profile was also very hoppy and fruit forward, but fairly bitter and slightly astringent as well. Grapefruit dominated. White grapefruit specifically. The Galaxy hops definitely made their presence known here. Tangy clementine and kumquat notes were also apparent. Subtle honeydew melon-like quality in the center. More grapefruit and grapefruit rind on the back end and in the finish. Super pithy and dry. Big, bitter, grapefruit rind and pine resin notes lingered after the swallow. With time, the bitterness mellowed out slightly. Medium-light bodied mouthfeel. Creamy, slick and smooth. The liquid contained a fine, moderate effervescence that frothed up nicely on the palate. 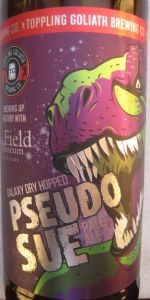 Galaxy Dry Hopped PseudoSue is a punchy, fruit-forward and overall really interesting take on a New England-style pale ale. Like the original PseudoSue, however, this beer turned excessively pithy and bitter on the finish. With a bit more balance, this could be stellar. Drank a fresh bomber in my TG chalice on 6/18/2016. This is another great offering of this dry hopped TG run. The hops are nice and bitter, but definitely bring out some tropical citrus flavors and some melon flavors as well. Fruity, bitter, and kinda dry too. Not as potent as many dry hopped IPA offerings out there, but the flavors are well put together is this is a phenomenal beer. Glad I have another!